Drop new beasts, foes, and friends easily into your Pathfinder game with Pathfinder Pawns! 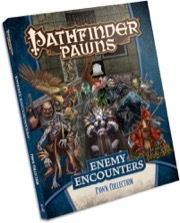 Pathfinder Pawns are released in two formats: boxed sets (these include roughly 200 unique pawn types and plastic bases) and collections (these include roughly 100 unique pawn types and no bases; additional bases may be purchased separately here). Each Pathfinder Pawn features artwork by premiere fantasy artists and can be easily used in any Pathfinder or fantasy campaign. Paizo releases an average of three new Pathfinder Pawns products annually, with each set providing you with dozens of monsters and personalities to bring to your table. With your ongoing Pathfinder Pawns subscription, we'll send you each new installment and charge your payment method automatically as we ship each product. You only need to sign up once, and never need to worry about renewal notice or missed products. By starting a Pathfinder Pawns subscription, each release will be automatically bundled with any other Paizo subscription items you're subscribed to releasing in the same month. You may change your starting set during checkout. I admit I was skeptical about how useful these would be when I first opened up the Pathfinder Beginner Box, but after using them it's amazing how they just dissolve away and you no longer think about them as these cardboard cutouts. You just see the NPCs or the enemies (in gorgeous detail for that size). It's very clear to me, over the course of two Adventure Paths using only Pathfinder pawns, that it's truly an amazing investment for the price point. I hope Paizo continues to make them! i buy this one monday 6th at amazon, today it arrives, very hasty timing Cheers for amazon!! Good pawns, i dont realy care the absence of bases in this expansions, and the fact that pawns haven´t colossal sizes!! but what can annoying me, is the fact that theres a lot of missing creatures and npcs from this, and rotrl!! If I sign up to this subscription, what happens with previous preorders of products included? Do they automatically get 'swapped over' into the subscription or would I have to ask for the preorders to be cancelled? I am assuming that akin to the other subscriptions that signing up for this will automatically move any existing preorders over too. They cancel any preorders automatically, unless you ordered multiple copies, in which case they just cancel one of them for your sub copy. 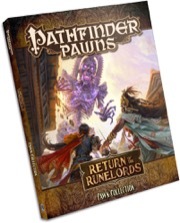 Does being signed up for the Roleplaying Game or Adventure Path subscription still get you the free PDF for the pawns, or is it now necessary to have the Pawns subscription in order to qualify? Sweet! Dreams do come true. With the Pathfinder Battles subscription, I really can’t justify going with this, as well. I can - minis for physical tabletop use and the PDF of the pawns for making tokens for virtual tabletop use. The physical pawns will only come out if I need something I don't have a mini for. Well, we don’t use a virtual tabletop. So again, for myself, it’s not a purchase I can really justify. If I was to get the pawns, it would be for the physical pawns themselves, and I achieve that with the miniatures. How does this work with Gencon pickup? When I checked out it showed an extra 13 bucks for shipping for the Beastiary Box. My hope is that the subscription to the pawns will eventually give you access to the "electronic pawns" for use on the Paizo Game Space. Or...if you have a pawn subscription, you could pay say $5 more to also get the Game Space version...hint, hint Paizo. I think you meant to post this in the Pathfinder Comic Subscription thread. But that answered one of my questions, as well. If I am getting charged shipping for each comic (not shipped together), I will have to pass. I'd have to agree with you, I would think if you get 4 (or 5) of those comics, you should be able to have them shipped together. Edit: Interesting. I'm still a Superscriber even though I don't have a pawns subscription. Well dang. I had to drop my subscription to Pathfinder Battles once I saw how expensive the next shipment is and now these pawns are becoming available. They're still a little more than I want to pay but they're certainly much more affordable, especially given that you get the pdf with them. Edit: Tag may be subsumed by the PAIZO Charter Supers... but not those of us who are only Pathfinder Superscriber. That was a display error which has since been corrected. Multiple comics will ship together, for one shipping price (and can also be combined with other subs). All of that is still true, though those four sets will now *also* provide the free PDF benefit to Pawns subscribers. Products announced in the line from here on out, though, will *only* provide the benefit to Pawns subscribers. Hmm... adding this to my subscriptions isn't going to drastically slow when I get mine shipped out? Duly noted (and subscription updated). Still, I guess your cunning marketing plan worked - the 'free' PDF for the Bestiary Box is what finally nudged me into adding the Roleplaying Game subscription. As a recent subscriber, one question I have is this: if I buy pawns (or anything else) at Gencon do I still get the free PDF? I really want to buy some there to use for PFS but the PDF would be nice. I would also rather avoid the hefty international shipping charges. I believe that you can arrange in advance to pick up the August subscription shipment in person at Gencon. You just need to email customer services. So if you are subscribed to the pawns already, it shouldn't be a problem. As for the shipping - yeah, ouch ~$50 on a ~$20 product! So the shipping on this baby is ohmygodwtfbbqzomg. Guess I have to wait for Amazon with this one! Amazon show it as unavailable. Book Depository claim to be able to get it for £16 delivered. Given the pain I went through while trying to get the Beginners Box out of Amazon, I'm reluctant to have anything to do with either of them for RPGs, but I might have to if customer services can't find a way to reduce the shipping on the upcoming minis and this. Paizo really need a European distributer that gets the months subscriptions shipped in a container and re-posts them within the EU. The long answer is that, when it comes to the pawns, there are really three answers. 1. You're an Adventure Path subscriber, and the Bestiary Box—which is the set being released at Gen Con—confers a free PDF benefit only to subscribers of the RPG line or the Pawns line, not the AP line. 2. The Pawns sub benefit only applies to copies purchased as part of a subscription, not to copies you'd buy separately. 3. The RPG line sub benefit only applies to *preorders* for the Bestiary Box, and by Gen Con, it won't be a preorder anymore. Speaking generally about subs that offer free PDFs as benefits, the answer is that if you've already told us you're picking up your subscriber copy at Gen Con, you'll get the associated PDF when you pick up your subscription copy... but the deadline for telling us you wanted to do that was yesterday; if you didn't do that, your sub is scheduled be shipped during the week of the show, and you'll get the PDF at that time. The Rise of the Runelords Pawn Set is under 2 pounds, so international shipping will be a lot cheaper. Though I myself do not have any interest in the pawns or paper minis. But I strongly recommend those who are not as obsessed with minis to spend thousands of dollars to create a decent collection for RPG minis use. So heartily endorse this line. Really excited about this one! Perfect option for people on a budget. perfect. What's the price point for this subscription going to be and how frequently will releases be made? Also, what will S&H look like when it's bundled with another subscription (i.e. i have the Adventure Path subscription already). The price is going to vary with the different boxes, for example, the Bestiary Box is $34.99 and the Rise of the Runelords set is $15.99. The differences in sizes are also going to affect the shipping costs. We can't hand out specific quotes for shipping because it is going to depend on what other subs a person has, which pawns set it is, the location, the shipping method, etc. Does anyone know what weight of cardstock the pawns are printed on? What's the price point for this subscription going to be? Note that's the price before the 15% discount from Pathfinder Advantage is applied. So if you're still eligible for the discount at the time the products ship, the prices would be $29.74 and $13.59 respectively. The only pawns I've handled are those from the Beginner Box. But assuming future pawns are of comparable quality, it would take multiple sheets of the heaviest card stock I can put through my home printer (110 lb) to match the thickness of the pawns. I don't have a pawn here to check, but I'd estimate I'd have to build at least a six-sheet laminate to get close. You can special order sheets heavier than #110. What I planned to do was print on full sheet sticker paper then peel and stick to whatever card stock than place a clear laminate sheet over the top. Sure. I wasn't suggesting sticking half a dozen sheets - maybe more - together as a sensible technique; I was just guessing at the rough thickness you'd be aiming for (assuming you want to be able to use the same bases as the official Paizo pawns), and 110lb stock was all I had to hand. Putting a clear laminate on the top would ne a nice touch - I'm always a bit worried that one of the markers being used to draw maps might end up making unintended additions to a pawn. You'd also be able to write temporary tags on multiples, although in that case you could also print #1, #2, ... directly on the pawn before laminating. I just downloaded my pdfs and I want to say that the art work on these is really beautifully done. I'm still sad that I can't afford the Battles Minis but so far these look like they're going to be an excellent cheap substitute. They really exceeded my expectations. I can't wait to see what the physical product looks like. I haven't gotten my shipping notice yet but I can't wait for these. I have a feeling it'll be a long wait until September for the next set of pawns. They should be the same. They're about 1/16" (2mm) thick. Will there be pawn collections to support previously released AP's or will these only support upcoming AP's? Cool, how frequently will they be released? Look HERE, under All Products. I thought that I saw an announcement for Shattered Star for Jan/Feb 2013, but it is not on the product page yet. Update: UPS dropped off a box tonight (at a little after 8:30pm!). Yay!! The stack of 16 sheets of pawns in the Bestiary Box is very nearly 34mm (roughly 1 5/16") thick. Sweet, didn't know about the free pdf of RotRL pawns for AP subscribers. Yay! Mine got dropped off last night too. Nice thick sheets, great art, extremely easy to set up. I love these. (From a gamer's point of view)It's just a shame, these do not cover all the monsters in an AP like the paper minis series do. Fingers crossed! I am running Serpent's Skull for two groups and would love to see pawns for that campaign. My paper minis are starting to look worn!